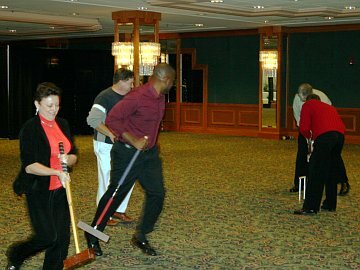 As part of a department Christmas breakfast at Winston-Salem, NC-based RJ Reynolds Tobacco Company, Danny Huneycutt was asked to provide indoor croquet games for the 200 employees during a one hour session. Individual skill contests made up the first 25 minutes, contestants competing in longest hoop, consecutive hoops made, jump shot, and skee-shoot contests. After Danny and his co-worker Jeff James gave a Top Gun Croquet demonstration, twelve teams played in a single elimination ladder for prizes such as promotional blankets, coffee mugs, shirts and hats. Top Gun is a fast moving game that is a spectator’s delight. Some typical comments were: “It’s been a long time since I’ve had so much fun”; “I’ve only played with those wire wickets”; and “We have to do this again”. Next time you’re part of a large croquet event put in the request to play Top Gun.